My fiancé is a spoken word performance poet, and I am a lover and published author of poetry. This is kind of what connected us and we want to use this as our theme. However I am having the worst time coming up with any ideas to use as far as decorations that include poetry, table settings, anything. I am clueless. Do you have any suggestions as far as a poetry themed wedding, favor, decorations, etc....? For your invitations and wedding programs, add poems that you have written, or add a famous wedding-related poem. Work poems into your wedding vows. Choose poems that each of you have written, or choose verses that hold a special meaning to your relationship. Have two or three close friends or family members read your favorite poems during your wedding ceremony. Instead of table numbers, use famous poets. So, instead of guests sitting at table 5 they will sit at the Maya Angelou table, for example. Or, if you have one favorite poet, each table can take the name of a poem. If you chose Robert Frost, for example, table names could include The Road Not Taken, Fire and Ice and The Lockless Door. A wishing tree is a great way for guests to leave you a special note on your wedding day. The leaves can be decorated with poems on one side, and your guests can write you a special wish on the other side. When they are finished, your guests hang the leaves on your tree. Wishing trees are sometimes used instead of a guest book. Cover your cake table with an embroidered table linen. Personalize it by having your favorite love poem embroidered into the linen. 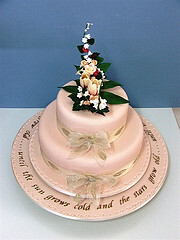 Your wedding cake can also be decorated with words from a poem, or you can also have your cake displayed on a serving plate that is decorated with a poem (see photo). For your wedding favors, consider collecting all of your favorite love or wedding related poems into a small book to give to your guests. Include poems that you have written and poems that reflect what your relationship means to you both. Bookmarks work well also, and they can be decorated with just about any photo and poem. Mini poetry kits are yet another option for wedding favors, and there are magnetic poetry kits available in many different themes and styles. Hopefully these ideas will help you get started with your poetry wedding theme. We would love to hear any ideas that you come up with, so please leave a comment! Join in and write your own page! It's easy to do. How? Simply click here to return to Wedding Theme Idea.